Boldt Castle is a 120 room mansion that is located near Alexandria Bay, New York. The castle was designed by the firm of W. D. Hewitt and G.W. Hewitt, Architects, Philadelphia, Pa., who also designed Druim Moir castle in Philadelphia. Boldt Castle was built at the turn of the century by multi-millionaire George C. Boldt for his wife, Louise, as a testimony of his love for her. Mr.Boldt invested over $2.5 million to build this replica of a Rhineland castle. He planned on presenting it to his wife on Valentine's Day. Work was underway on the eleven buildings that would comprise the castle complex when in January of 1904 Louise Boldt died, ending the dreams of a lifetime. George Boldt ordered that all work be stopped and for 73 years the Castle and the other structures on the island were left to the forces of nature. The Thousand Islands Bridge Authority acquired the property in 1977 and decided to preserve it for the enjoyment of future generations. Since then several million dollars have been spent rehabilitating and restoring the castle and surrounding structures. 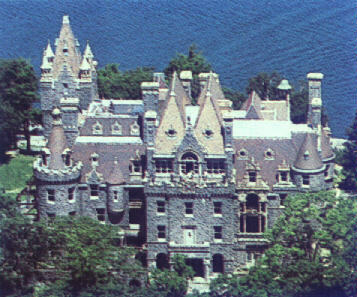 Boldt Castle would have been one of the largest houses in America, had it been completed. The main structure is seven stories in height and contains more than 120 rooms, with 30 bathrooms. It is one of four important buildings open to the public, including two smaller stone "castles" and a gigantic, towered yacht house. The reason for abandonment of the project when nearly finished has been the subject of speculation for nearly a century. The 320-page illustrated book "Boldt Castle: In Search of the Lost Story" (July 2001) provides startling new information about the popular mystery. To return from their page to this page, click on your BACK button. Recently I had the privelidge of helping to build the large, stained-glass dome skylight for Boldt Castle, in the 1000 Island Region of Northern NY State. I have always loved Boldt Castle, and the stories that surround it, so that was a special thing for me to be able to have done. I have spent the entire summer building a website about Boldt Castle, and wanted to bring your attention to it. My new website is over 340 pages, and offers tours of the castle and other island structures, has many stories about the history and tragedy surrounding the castle, and has an interactive message board, castle gift shop and castle greeting cardshop as well as many other features too numerous to mention, including 13 photo albums containg over 200 photos of the castle and its grounds.. Please have a look and let me know what you think. "Boldt Castle - A Virtual Tour"
I recently found your site and visited Boldt castle. They have come a long way since 1977 with rennovations. Most of the first floor is finished along with the power house, boat house and other out buildings. Also they have made much progress with the grounds, including an italian garden. It is well worth the trip. The Boldt Castle elevator went into service May 23rd, 2005. Elderly and disabled visiors now have access to four floors, plus the basement. The observation deck on the fifth floor must still be reached by an additional staircase. All visitors are permitted use of the elevator. The Castles of the United States's own Phil Bilzor was the first guest ever to enjoy this welcome improvement to the Boldt Castle/Heart Island experience.